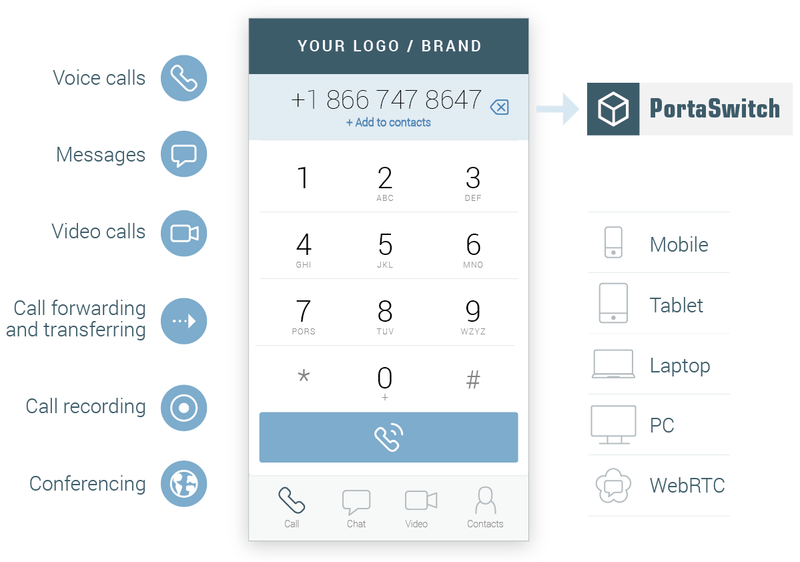 PortaOne mobile app allows communication service providers to offer their clients the benefits and flexibility of IP telephony via a mobile app or browser – quickly, with zero investment into app development. PortaPhone is a new add-on product that goes with PortaSwitch. It’s an app, developed by us and our partner Acrobits, that our clients, communication service providers, can upload to app stores (for iOS and Android) under their own brand name. In other words, if you are a provider, you can offer your subscribers a new, ready-to-use product and launch it instantly. How does the app benefit your customers? Your business customers can use a mobile phone app as an extension of their cloud IP PBX. Simply put, they can use PortaPhone instead of an office IP phone, saving money on purchasing desktop phones. It provides your business customers’ employees access to their work phones anywhere and anytime. Calling extensions, call forwarding and recording, texts, your address book – all of the IP PBX features are available in the app. For consumers, it means cheaper international calls and an opportunity to save money on roaming when traveling. Since PortaPhone is integrated with PortaSwitch, your subscribers can check their balance and see the cost of a call right in the app. The app can be customized easily. You can upload your logo, change graphic design, manage the available feature set for customers, and quickly publish it to Google Play and / or the App Store under your own name - you have full control over the app. The app is fully integrated with PortaSwitch; your subscriber only has to download the app from an app store (Apple or Android), go through a quick registration (with his phone number and SMS code), and the app automatically provisions and receives its service configuration from PortaSwitch. When changes are made in the IP PBX, the app updates automatically. The backend infrastructure (Push and WebRTC servers) is activated on your PortaSwitch servers in your collocation and is easily scalable. As always, we offer this product on a SaaS basis, with no additional charges per subscriber or per feature. No matter how many people download your app - the price stays the same. We published a demo version so you can download the app and test how it works: check the verification process and user interface, make test calls, etc. To learn more or add PortaPhone to your services, contact our sales department.